Photographer: Kristian Schuller. Model(s): Julia Hafstrom. Source: Harper's Bazaar Turkey. Stylist: Sarah Gore Reeves, Set Designer: Peggy Schuller. Makeup: Helene Vasnier. Hair: Felix Fishcer. 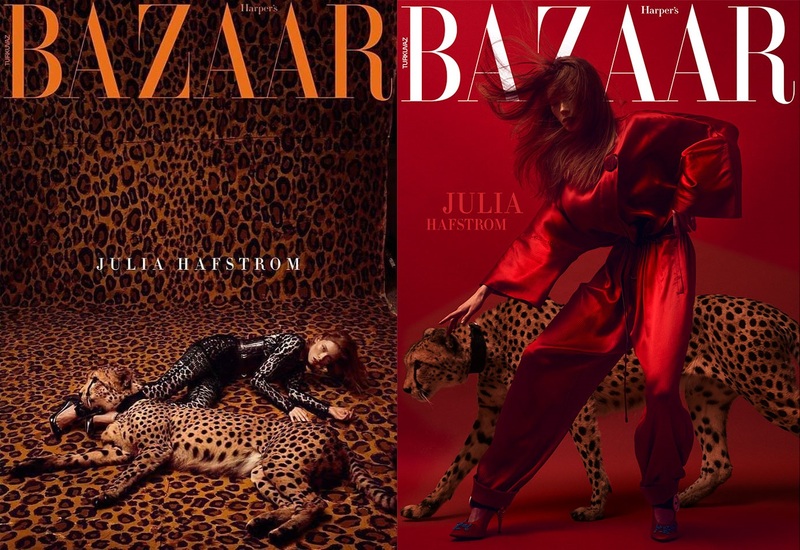 Julia Hafstrom becomes one with the leopard in this exquisite editorial by Kristian Schuller for Harper’s Bazaar Turkey, December 2017. I see this story as symbol of strength. The spirit of resilience that resides inside our collective souls has been waiting patiently to be called to duty. We have learned to harness our power. We have witnessed a significant shift in our struggle for Equality. 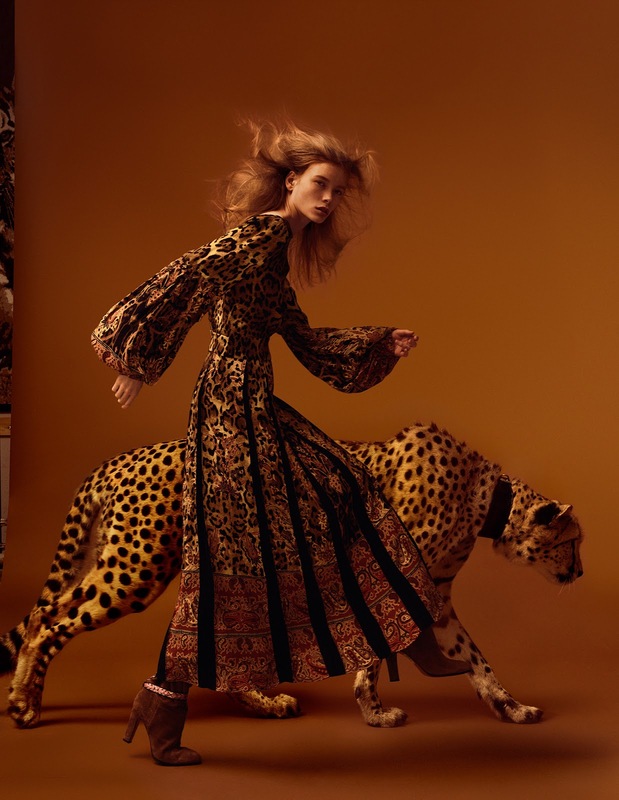 Is is she who mimics the animal or the animal the mimics she? Woman & animal collide in this collection of creativity capturing what I call… The Stealthy Silence of She. We watched as women and men from all parts of the world came together in an effort to change our course directive. Poetically Profound, the Women’s Walk last weekend wasn’t about rewriting history, it was about forging our future. These images don’t depict a lioness capturing her prey, they celebrate the inner power of today’s female. This freedom to connect is where our story begins. Julia moves through the editorial with the heart of a jungle cat. Her Animal Nature Reads Through the Page as She Walks into Each Shot in a Quiet Rage. Like that of many females, she feels the fire that burns beneath her. Rage has been Simmering for Such a Long Time, Turning Kittens into Tiger Like Water into Wine. Our time of silence is over. We are not “acting” any longer ~ we are finally becoming. Becoming More Powerful, Becoming More Human, Becoming Who We Were Made to Be. For this is first a question of humanity. The more you play it down, or cast it off as something insignificant, the more you embolden us to rise. We Will Unite to Fight. THE TIME FOR TALKING IS DONE… THE TIME OF ACTING HAS JUST BEGUN. Honoring our natural roots, Helene Vasnier delivers a cosmetic collection of the highest order. When you look into her eyes you see her wild side. 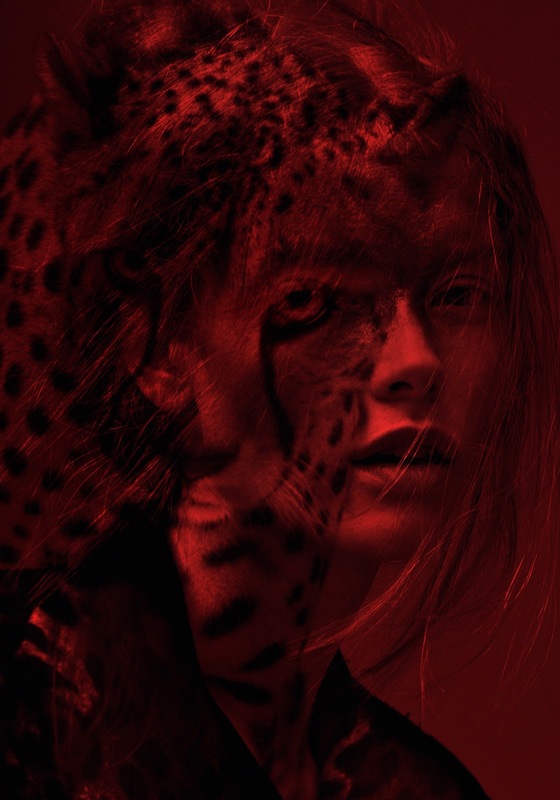 Beauty blends as her primal pretty take on animalistic characteristics. Her features expose us to the sharpness of her facial structure, laying over her bones in a primal act of purity. 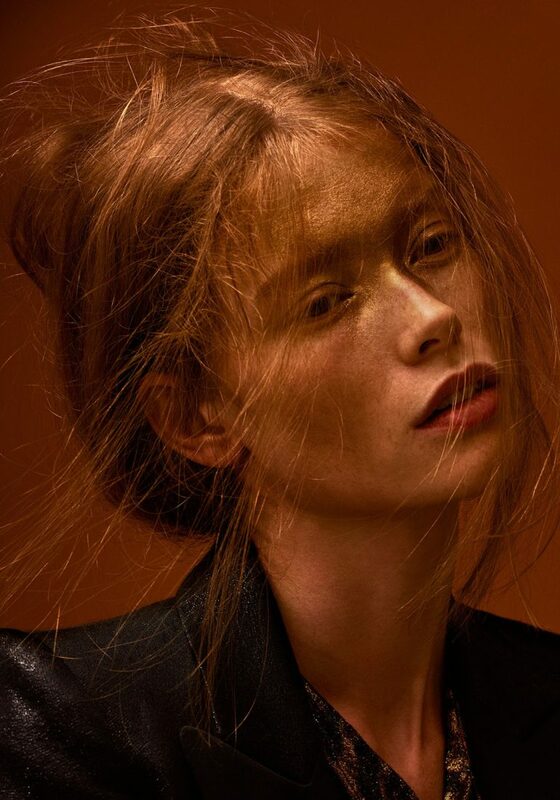 A golden hue casts a shadow over her skin, bringing out the luxurious tones of the cat’s coat. Feline and Female fuse, highlighting their striking similarities. Peggy Schuller creates a set so intoxicating, we find ourselves lost in the luxury of the moment. She’s kept the backdrop solid, with saturated tones of red, purple and gold. Distinct designs play to the theme, with fashions that feel more like coats of color and prints of skin. 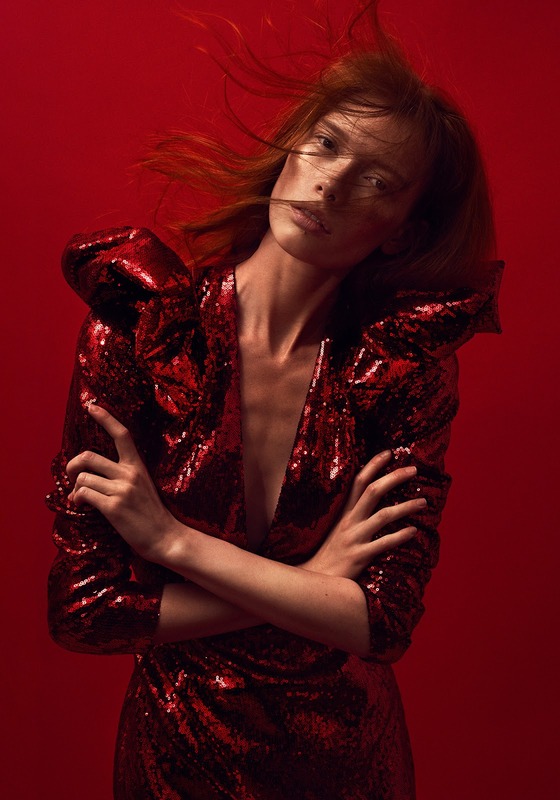 Solid shades bring out the vibrant leopard prints, as Sarah Gore Reeves fuses fabrics from red sequins to scarlet fur. Felix Fishcer lets nature take it’s course, by matching strands of amber hair with the cat’s natural coat. Powerfully Provocative, as they walk side-by-side we begin to appreciate the connection. The Long, Lean Lines of this Gentle, Jungle Cat Stand as an Expression of the Female Spirit. She’s a Freedom Fighter ~ who will go to great lengths to protect the ones she loves. We never imagine the animal with that kind of upper level intellectual prowess, however, we do see that the instincts are of the same caliber. I watched many women from all parts of the world unite this past weekend, and I can say without hesitation, I felt my Inner Leopard Growl!